Thank you for your interest in the 2019 Pro Football Hall of Fame Enshrinement Festival. 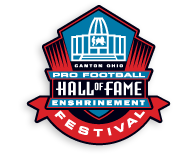 The Pro Football Hall of Fame Enshrinement Festival is a “Celebration of Excellence!” that draws nearly 700,000 guests to enjoy diverse events over two and a half weeks in Canton, Ohio. The professional staff and dedicated team of more than 4,500 community volunteers will do everything possible to accommodate your needs and make your Enshrinement Festival experience an exciting one. Please check back periodically for information regarding the 2019 Pro Football Hall of Fame Enshrinement Festival and how to be properly credentialed for 2019.